Perspective, the author tells us, is easy; yet surprisingly few artists are aware of the simple rules that make it so. This easy-to-follow book -- the first devoted entirely to clarifying the laws of perspective -- remedies the situation. In it, the author uses over 250 simple line drawings to illustrate the concepts involved. Beginning with clear, concise, immediately applicable discussions of the horizon, vanishing point, and the crucial relationship of eye level to perspective drawing, you'll learn how to place figures and objects in a drawing, depict interiors, create shade and shadows, and achieve all the other elements necessary for a successful perspective drawing. By repeatedly stressing important points, Mr. Norling teaches you to make them second-nature. Moreover, his approach is so simple and direct that no matter how little raw talent or experience you have, you will soon be able to apply these techniques almost instinctively. Mastery of perspective is a basic skill every artist must have. This simple, nontechnical guide will enable you to master its essentials in a relatively short time. Clear and concise, this book is an essential addition to any artist's bookshelf. From the Back Cover Perspective, the author tells us, is easy; yet surprisingly few artists are aware of the simple rules that make it so. 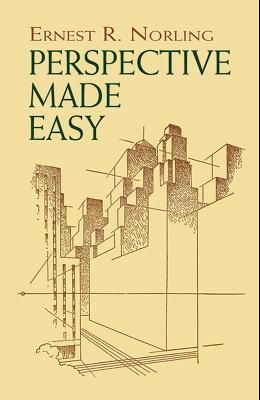 This easy-to-follow book--the first devoted entirely to clarifying the laws of perspective--remedies the situation. In it, the author uses over 250 simple line drawings to illustrate the concepts involved. Beginning with clear, concise, immediately applicable discussions of the horizon, vanishing point, and the crucial relationship of eye level to perspective drawing, you'll learn how to place figures and objects in a drawing, depict interiors, create shade and shadows, and achieve all the other elements necessary for a successful perspective drawing. By repeatedly stressing important points, Mr. Norling teaches you to make them second-nature. Moreover, his approach is so simple and direct that no matter how little raw talent or experience you have, you will soon be able to apply these techniques almost instinctively. Mastery of perspective is a basic skill every artist must have. This simple, nontechnical guide will enable you to master its essentials in a relatively short time. Clear and concise, this book is an essential addition to any artist's bookshelf.